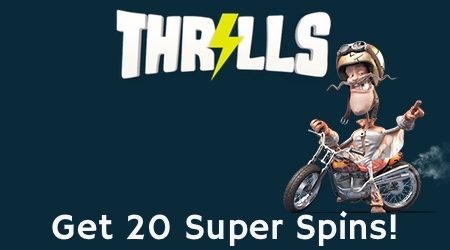 Claim 20 Super Spins without wagering requirement at Thrills! Don’t miss Thrills, the personal and crazy casino that gives away 20 Super Spins and a bonus at your first deposit! The Super Spins are worth €1 per spin and there’s no wagering requirement for the winnings. The Super Spins are given to you at the slot Starburst. You will get five free spins per day for four days until you’ve got the 20 Super Spins. As this wasn’t enough, you will also get a first deposit bonus worth 100% up to €100, giving you some extra money to gamble with. If you like Thrills and want to make another deposit you can look forward to a second, third and fourth welcome bonus. In total you can get a €400 in bonus at your first four deposits. There are many reasons why we like Thrills obviously one of them is their great welcome offer. Another thing is their superb mobile casino. We wish you a great weekend and good luck!